The Somaliland President, Muse Bihi Abdi, today inaugurated three new cranes at Berbera Port. The three mobile cranes are part of the redevelopment of the port currently managed by DP World. At an estimate cost of over $12 Million US, the new cranes will facilitate the loading and unloading of docking ships around the clock. 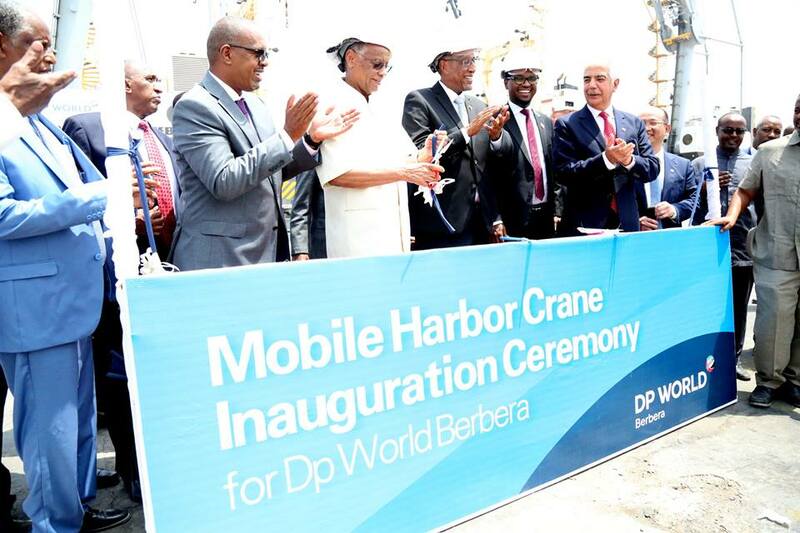 With a capacity of over 120 tons, the new cranes will make it easier for harboring ships without their own on-board cranes to use the port of Berbera. Speaking at the inauguration ceremony, President Muse Bihi paid tribute to all the previous leaders of Somaliland in their attempts to bring development to the port. The President stressed the need for all Somalilanders to see the redeveloping port as part of their national assets and to support the efforts to make the port a gateway for the people in the region in regards to commerce, travel, employment and investment. Despite severe criticisms from many sectors of the Somaliland public with regard to the transparency of the Berbera-DP World agreement, and the extent of the investments by DP World in the port, and the streamlining of the port’s operations; it is quite clear, that with each passing month, the port of Berbera continues to see vast improvements in it’s capacity and operations.